This venison Bolognese differs from the classic in just one way: the choice of meat. Here ground venison, not beef, is gently simmered with vegetables, wine, milk, and broth for hours to coax it into tender submission. Pasta was never so happy. 1. In a large heavy pot or Dutch oven set over medium-high heat, melt the butter. Add the onion, celery, and carrots and cook gently without browning, stirring often and reducing heat if necessary, until softened, 5 to 10 minutes. Sprinkle a little salt over the vegetables as they cook. 2. When the vegetables have softened, stir in the drained chopped mushrooms and tomato paste and cook, stirring often, until the tomato paste begins to darken, 3 to 4 minutes. Add the ground meat, the mushroom soaking water, and the broth or water. Bring to a simmer. Reduce the heat to medium-low and allow the mixture to ever so gently simmer, uncovered and stirring every great once in a while, until the liquid has mostly evaporated, 1 to 2 hours, depending on just how briskly your Bolognese is simmering. 3. Pour in the wine and continue to cook, uncovered and stirring occasionally, until the wine has mostly evaporated, 45 to 60 minutes. Add the milk, nutmeg, and black pepper and stir well. Bring back to a simmer and add salt to taste. Simmer gently until thickened, about 30 minutes more. 4. When you add the milk to the sauce, bring a large pot of water to a boil. Add enough salt to make it taste like the sea. Once the sauce has thickened, add the pasta to the boiling water and cook until it is al dente. 5. To serve, place the pasta in a large bowl and add a healthy ladle overflowing with sauce and gently toss to combine. Portion out the pasta and then top each with another ladle’s worth (or more) of Bolognese sauce. Grate the cheese over the top and serve. 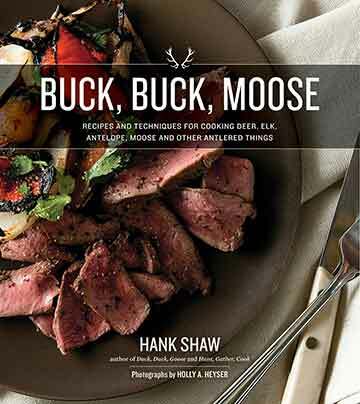 Venison Bolognese Recipe © 2016 Hank Shaw. Photo © 2016 Holly A. Heyser. All rights reserved. All recipes and photos used with permission of the publisher. 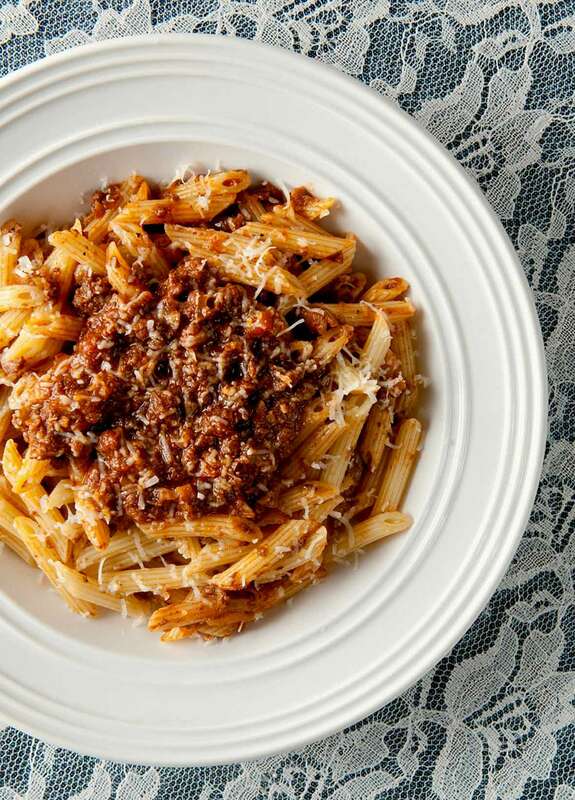 This venison Bolognese sauce is a wonderful way to use ground game meat of any kind. This is something to save and savor on a weekend. The process from start to finish is a four to five hour process after all. The reward is an addictively rich sauce with overtones of game flavour (I used farm-raised elk) present but pleasantly so. For those new to cooking with game, this dish isn’t overwhelming with the rich mineral flavor that some game dishes can have, especially if using meat from farm-raised animals. The layers of flavor created in a savory meat sauce is traditionally served with tagliatelle but I had the penne, which the author uses in his presentation. I feel it’s a better choice, too. The resulting pasta was served at the table with Pecorino Romano. This venison Bolognese is a great “Sunday supper” dish! It does take some time to make but much of that time is hands-off so you can go about your business and just check the sauce every once in a while. I kept the sauce simmering on medium-low and checked in on it every 15 minutes or so at the beginning and then every 10 minutes towards the end. The finished sauce falls somewhere between a traditional pasta sauce consistency and that of a ragu—really rich and meaty but at the same time still moist and saucy enough to coat the pasta. The sauce itself is mellow, meaty, and rich with the woodsy flavor of porcini mushrooms. I had never cooked with ground venison before and was surprised to see that it had a very different texture from beef. The meat is almost creamy and more gelatinous than I had expected and it adds an unctuous quality to the Bolognese. This is quite rich—a little sauce goes a long way. I served it on cavatelli pasta but I think that any chunky pasta with ridges to hold the sauce would work well. Served with a salad of curly endive dressed with a sharp vinaigrette dressing to foil the heaviness of the pasta. Molto Italiano! The next day I used the extra venison Bolognese to stuff some bell pepper cups and halved zucchini. I mixed 2 cups sauce with 1 cup shredded mozzarella. After stuffing lightly steamed veggies with the mixture, I topped them with a combo of 1/2 grated Parmesan and 1/2 bread crumbs mixed with a little chopped parsley and a minced clove of garlic. I then baked them at 350°F for approximately 35 minutes until the veggies were tender and topping was toasty brown. Delicious!